When Group 1 Crew released their 2012 album “Fearless” it was evident that they and the label were testing the waters for an inevitable Blanca solo album. Sure enough, shortly afterward Blanca announced her departure from the group. 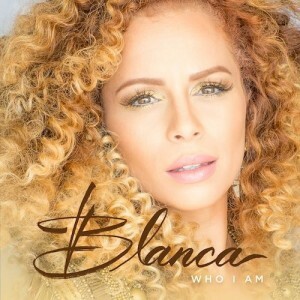 Now Blanca is back in full force with an appearance at Winter Jam and her first solo EP, “Who I Am”. From the get go there is a major stylistic departure from her work with Group 1 Crew. When Blanca first came on the scene she was unique, with a sweet but sassy edge. Songs like “I Had a Dream”, “Forgive Me”, and “No Plan B” showcased Blanca’s hip-hop side with deep and introspective raps. Some might call it a natural musical and personal progression, but Who I Am does away with any semblance of hip-hop, instead choosing to focus on Blanca’s powerful vocals. Make no mistake, Blanca has one of the best sets of pipes in CCM, but Who I Am does little to fully utilize them. There are a few songs that do showcase her talent, but for the most part it’s pretty subdued. Most of the album fits clearly into the pop/CCM genre, but there are a couple surprises. The lyrics and music are, for the most part, optimistic but cutesy, bordering at times on cheesy. There’s nothing wrong with them, but they lack depth and vulnerability and ultimately replayability. “Sunshine” speaks to God’s character and faithfulness, and is a decent track. Title track “Who I Am” is boring and riddled with musical and lyrical cliches. I’m running to the one who knows me, who made every part of me in His hands. I’m holding to the one who holds me, ‘cause I know who I am. I know who I am. “Echo” unfortunately isn’t much better, doing little to stray outside of traditional CCM fare. The chorus proclaims “In everything I do, I want my life to echo you”. Luckily “Not Backing Down” and “Different Drum” are much better, fixing this problem and taking some interesting chances. “Not Backing Down” is easily highlight of the album. It starts off like a Group 1 Crew track, but I was genuinely amused when the bass dropped and Tedashii started his verse. The EDM influence makes a fun listen, as does the percussion-driven “Different Drum”. Both songs are injected with an energy and joy that is missing in the first three tracks. Overall, Who I Am is an EP I might hand to my little sister, but I wouldn’t listen to myself. Blanca shows some potential, but is missing a lot of what made her great in Group 1 Crew. However, if Blanca’s next project were more experimental, along the lines of “Not Backing Down” and “Different Drum”, she could put out something truly special. I wasn’t impressed with this EP either. I expected a lot from Blanca when I heard that she was coming out with an EP. It was a very honest and interesting review Micah. Well done. Well I guess it seems that we have a difference of opinion, Mercy. I liked the EP, and each track was enjoyable to me. Sorry that you didn’t like the EP. Hopefully when the full length debut album releases in May it will resonate with you more. I hope I will like it Josh and thanks for the information about the release of the full album.